Axl Rose says Dr Pepper violated his rights. Sure. So, how hilarious is it that now Axl Rose is asking Dr Pepper to apologize for hijacking the Guns n' Roses brand in the name of free soda? If you've been living in a dumpster, maybe you don't know that Dr Pepper years ago said it would offer everyone in the U.S. a can of free soda if the band ever released another album, which it did last week, 17 years after the last one. Now, according to Ad Age, lead singer/procrastinator extraordinaire Rose had his lawyer send Dr Pepper a letter which " ... stated that Dr Pepper's campaign had exploited the singer's reputation and the 'eagerly awaited' album, and stated that payment would be sought for the unauthorized use of the Guns N' Roses brand." Sheesh. Axl, I got some news for ya: you exploited your own reputation by setting a new world's record for length of time between albums. The soda didn't make you do it. Apparently the letter goes to great lengths to portray the Dr Pepper promotion as a failure because it was actually hard to get the free can of soda. True. But I still think the lovely loopiness of the promotional idea outweighs the frustration on the part of some consumers. It was sheer genius, marred by an executional hiccup. 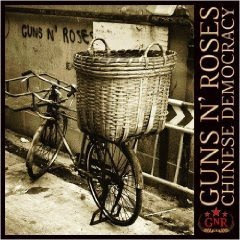 From what I've read, the album, "Chinese Democracy," doesn't rise to the same standard. --Yes, you are seeing the same ads over and over and over again. --Bob Garfield asks: "Whatsa matter with widgets?" --Time more popular with college students than People, allegedly. --Don't expect Tiger Woods to do another car endorsement deal soon. --Unilever moves to producing less colors for its packaging. If that's not a sign of an economic downturn, I don't know what is. --Even life at the Google-plex isn't as fun as it used to be. The search giant cuts back, a little bit anyway. --First came Black Friday; then Cyber Monday. But what about Mobile Tuesday? --Q&A with American Airlines' VP-corporate communications and advertising, Roger Frizzell. --Japanese way into the crowd-sourcing. --What your response to logos has to do with your nucleus accumbens. --Down with the economy, up with smartphones. --This holiday season, you may find that Jameson really, really speaks to you. --What brands will die in a GM bailout. --Regis Philbin upset with Commerce Bank merger with TD. --Hispanic market feeling the economic crisis blues. --Still not many people of color and other ethnicities in the ad business. Not that you should be falling over with shock. --Adweek asks if marketers can be the savior of the holidays. --CEO Robert Lerwill leaves Aegis. --Deutsch lives to work again with Sports Authority, winning the media planning and buying biz. --The return of barter to buy ads. --Barbara Lippert finds that Macy's endorsers aren't exactly dripping in Christmas cheer. See what she means. --Benjamin Palmer asks if impressions are really just views. --Ad of a Couple of Days Ago: American Express embraces Dave Matthews, Gwyneth Paltrow, Brian Grazer and Tina Turner (who even make a side reference to that Ike guy). --WPP's Team Detroit gets an assignment that isn't Ford, which is a good thing. --Online ad spending stable, with direct response ads leading the way. --More evidence that ad guys will never lose their movie-mogul aspirations. --What really happens to the advertising and marketing business during a recession. Good news for ad agencies; more bad news for CMOs. --Procter & Gamble uses "What Not to Wear"'s Stacy London to change its strategy for Pantene again. --Food companies associate themselves with a rodent, an animated one. --P&G launches brandSaver Live!, a coupon event, at 57th and Sixth. --Recession means marketers won't go mobile next year. --Holiday shoppers say screw the economic crisis! --People liking the car-buying process. Maybe because it's full of deals, deals, deals! --7-Eleven launches its own packaged-goods line. --Banks find a new use for direct mail: resurrecting their lousy image. --AOL opens gamesavvy.com, which helps us dumb parents figure out what the hell we're buying for our kids. I'm heading over there now. --Will the recession make people even more likely to watch free content? You betcha! --HBO thinks consumers will pay $54.95 for Saturday's Oscar De La Hoya-Manny Pacquiao fight, but is giving out coupons which offer discounts too. --Out-of-home says it will fully recover in 2010 after a tough 2009. --More of us watched the Macy's Thanksgiving Day Parade this year. Was it the performance by Rick Astley? No, that was a surprise. --Why aren't publishers using more widgets? --Lenny Dykstra discovers publishing a magazine is harder than it looks. 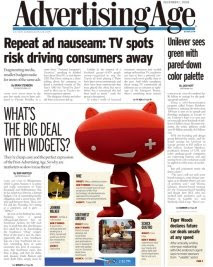 --Ad sales for the Super Bowl are described as "sluggish." --CNN nudges in on the AP's turf. --Turns out U.S. media companies didn't enhance the country's international image in the post-9/11 world. --Pity the aging local news anchor. --Stuart Elliott asks 20 questions, including: "Will Citibank have to change its slogan, 'Citi never sleeps,' because it now suggests that anxious executives, worried about solvency, are staying up all night?" Good one. --Time publishes high-end Time Style & Design magazine. A company spokesperson says it put the issue together in October, when things were just lousy instead of super lousy. --David Carr says the news media is partly to blame for the death of that Wal-Mart worker. -"Four Christmases" does well at the box office, while no one cares about "Australia." Free. --Cable: panacea for a recession-plagued populace. Subscription required. That's it. Oy, that first Monday back from Thanksgiving is rough.